SALE. This is the standard, single-user version. ACCOUNTING Year 11 content is sorted by NCEA Level One Achievement Standards. A .pdf copy of the teaching/learning notes is available free on request. ​This multi-user version may be used by up to 10 students throughout the year. The content is sorted by NCEA Level One Achievement Standards. ​NEW. Hour long, one-on-one or small group online tutorials are now being offered for Year 7-13 English students. Free access to eLivewire online learning and book resources are included. SALE. Purchase this subject and you get a FREE 30 minute tutorial. This is the standard, single-user version. ENGLISH Year 11 content can be sorted either by Topic or by NCEA Level One Achievement Standards. A copy of the AS1.3 Unfamiliar Text work book with questions in the latest NZQA format is available for only $8.95 + postage. See below. ​This multi-user version may be used by up to 10 students throughout the year. Content can be sorted either by Topic or by NCEA Level 1 Achievement Standards. ​This workbook provides 16 close reading extracts taken from our elearning site but with NCEA style questions. It should be used in conjunction with the eLivewire program. SALE. Online tutorials are available at $45 per hour. This is the standard, single-user version. MATHEMATICS YEAR 11 content can be sorted either by Topic or by NCEA Level One Achievement Standards. Basic Maths Skills modules are also included. ​This multi-user version may be used by up to 10 students throughout the year. Maths Year 11 content can be sorted either by Topic or by NCEA Level One Achievement Standards. SALE. Tutorials available at $45 per hour. This is the standard, single-user version. 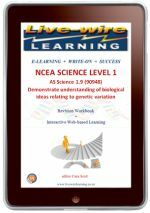 SCIENCE YEAR 11 content can be sorted either by Topic or by NCEA Level One Achievement Standards. Photocopiable pdfs of the Mechanics, Acids and Bases and Genetics workbooks are priced at $2.50 each and can be ordered at editor@livewirelearning. Each standard contains detailed revision notes, graded questions and answers. This multi-user version may be used by up to 10 students throughout the year. Science Year 11 content can be sorted either by Topic or by NCEA Level One Achievement Standards. ​This workbook contains 9 chapters with detailed notes, full colour illustrations and photos, questions and answers. It should be used in conjunction with the eLivewire Science Year 11 program. ​This workbook contains 15 chapters with detailed notes, full colour illustrations and photos, questions and answers. It should be used in conjunction with the eLivewire Science Year 11 program. ​This workbook contains 4 chapters with detailed notes, full colour illustrations and photos, questions and answers. It should be used in conjunction with the eLivewire Science Year 11 program. ​This is the special, single-user, revision version. It was created to be used in conjunction with the Achievement English@ Year 11 revision book written by Jenny Thomas and Diane White. The content is exam specific.